Indian startup scene is on fire: almost 100,000 new companies were registered in India last year, and since last three years, almost $3 billion has been invested in new ideas, applications and portals. People are leaving their cushy IIM powered jobs and choosing to become job creators inplace of job seekers. 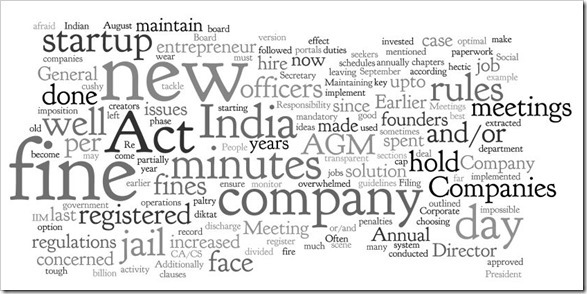 But does every startup in India hold an AGM or Annual General Meeting regularly? Does every startup record their minutes spent in meetings or hire Company Secretary? Have they made any plan to implement Corporate Social Responsibility in their day to day operations? I am afraid that startup founders can face heavy fine and/or jail term in case the guidelines outlined in the new Companies Act 2013 is not being followed. The new Companies Act 2013 was approved by the President of India as on August 29, 2013 and was partially implemented from September 12, 2013. The Act has now come into full effect since April 1, 2014. The old Companies Act 1965 had 658 sections, which has been divided into 29 chapters having 470 clauses and 7 schedules in this new version of the Act. There are some rules and regulations which were mandatory earlier as well, but then the fines and penalties was very less: sometimes Re 1 as well. But now, the fines have been increased and the rules made tough so as to monitor each and every activity of the company and make the system more transparent. For example, every company registered in India has to maintain a register of minutes spent in meetings. Earlier, the fine for non-compliance with this rule was Rs 500, which has been increased to Rs 25,000. Additionally, the Director of the company may face fine upto Rs 5000 per day as well. In case any company registered in India doesn’t hold Annual General Meeting (AGM), then there is a provision of Rs 1,00,000 fine in addition to Rs 5,000 per day for the key officers concerned with the company. Earlier, the fine for the ‘corporate offense’ used to be paltry Rs 500. The problem is that, with so many issues to tackle, the new age entrepreneur can be overwhelmed with issues related to his new company. Often in the starting phase, the founders have to wear the cap of almost every department. In such hectic schedule and deadlines, it becomes almost impossible to maintain minutes of minutes and hold ‘board meetings’ annually. But being a government diktat, there is no much option left as well. A solution must be extracted out. And the best one is to ensure that you hire a CA/CS to do all the paperwork! What according to you can be an optimal solution for the new entrepreneur to deal with this imposition of rules and regulations?